Legendary Gold Limited in collaboration with the Federal Ministry of Tourism, Culture & National Orientation, Environment and the World Fashion Organization proudly announces the official opening of designers and exhibitors participation for the Nigeria Fashion Week 2012 scheduled for the 8th – 10th November at the prestigious Muson Centre in the heart of Lagos. Those expected to participate includes Fashion designers, Textile, Garment & leather products manufacturers, Makers of wedding garments and accessories like cakes etc, Producers of lingerie/under wears, Jewelleries, wrist watches, shoes, bags, hats, Manufacturers of cosmetics, make-up, hair and skin care products, Producers of Zips, buttons, threads, tape rule, Manufacturers of various industrial sewing, embroidery, pressing and cutting machines. The 2011 event with the theme ‘going green’ presented 42 designers and 39 exhibitors from 22 countries. It attracted both national and international media. The high point of the week was the ‘going green collection’ where most of the participating designers presented special garments made from recycled materials. It was to draw awareness to climate change issues. Following the success of last year’s theme, this year’s event, tagged ‘going green 2’ promises to create a bigger platform for eco-fashion -or sustainable fashion as it is also called. More participants and international media are expected as well as buyers from Milan, New York, Australia and Asia. Nigeria Fashion Week 2012 ‘going green 2’ will be declared open by the President of the World Fashion Organization, Paco De Jaimes. “We look forward to welcoming you all to the exceptional hospitality of the Nigerian people” says Lexy Mojo-Eyes, President of Nigeria Fashion Week. 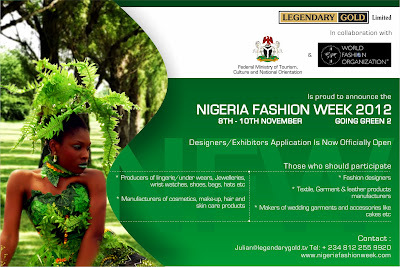 please contact Legendary Gold Limited at julian@nigeriafashionweek.com/ tel: +234 812 255 9920 or visit www.nigeriafashionweek.com.